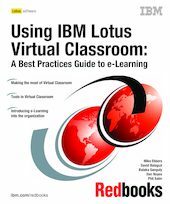 This IBM Redbooks publication discusses Virtual Classroom features. In this edition we provide new information, such as a test drive of product features from learner, instructor, and administrator perspectives; planning and installation guidance (including troubleshooting information); and a sample LotusScript routine for exporting users. Changed information includes a description of the architecture, and additional hints and tips on course design and development. The audience for this book includes e-Learning planners, developers, instructors, facilitators, and learners. Knowledge of e-Learning fundamentals is assumed.